The Houston city controller is the second highest elected official in the city. 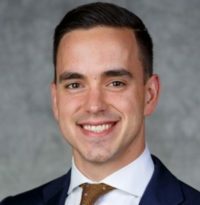 Max Moll, a 2016 George Washington graduate, works alongside the city controller on a daily basis as Communications Director for the Controller’s Office to effect change in the community. Early in his career, Max joined a political consulting firm that ran campaigns. During his time lobbying with the firm, he grew interested in earning a master’s degree. He wanted to earn his master’s, but knew it would be difficult around his unpredictable work schedule. Max needed a flexible program, which he found with George Washington University. A skeptic of the online structure, Max quickly learned that GW’s master’s in political management program was both challenging and convenient. It’s hard to succeed in an industry as crowded as politics. Luckily, Max developed a toolkit for success. He says his degree has helped him advance in his career and command a higher salary.